I saw this book on my new book shelf recently, and again, the cover made me pick it up. 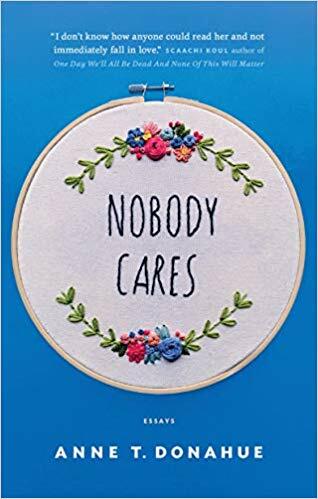 I am trying to embroider and this cover is just amazing. I include it here for you to see what I mean. But more than the embroidered cover graphics, the title really resonated with me. I wonder how many people really feel so left out in today’s society. This is a book that will be picked up by others for this very reason, I am very sure. This is a frank, funny and personal essay about the difficulty and messiness of being alive and living in this world. No one of us feels perfect. And Anne T. Donahue shares that very sentiment with her readers. What few of us remember but should is that we can learn a lot from our mistakes and weaknesses. All we have to do is to try to tame our negative self-talk, which is never easy, regardless of how we look at it. Anne Donahue shares her insights about messing up and what she learned in the process. Her honesty and reassurance that none of us free from messing up is a great lesson for the younger adult as well as the older. We have all done things that we weren’t proud of and we have to move past it. This book is an honest assessment of life in all of its tumultuous. I just loved the book and how it reminds me to be self-compassionate with myself, especially when I screw up.